After air toxicity, unprecedented encroachment in the Ridge forest area and a dirtier Yamuna, the Capital finally has some good eco news – the arrival of its first ‘green home’. House number H-1456, named ‘Green One’ is located in South Delhi’s Chittaranjan Park (CR Park), less than 100 metres from the local police station. “It is the ITC Green Building in Gurgaon that influenced me. So I pulled down my house in C.R. 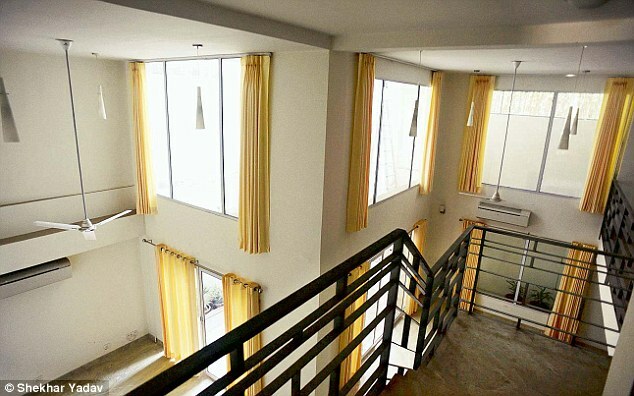 Park and re-built it using environment-friendly and recycled material,” Proshanto Roy, the owner of the house, said. “Only a few bricks from the leftover debris were used. These are made using industrial waste materials. Conventional bricks are considered carbon dirty and it also spoils the earth. Furthermore, several kilograms of coal have to be burned to make a kilo of brick. That is simply wasting valuable natural resources,” Roy added. Artificial lights with low power density (LPD) have been used throughout. The home features several large windows and a solar panel.